Sometimes it’s not us. But then it is. So for the last few days I’ve been hearing a young rooster, learning to crow, coming from the back neighbours property. Every morning I stand in our kitchen with a small smile listening to the half scream, half dying antelope sound coming from the yard and smugly think “at least someone else is making the noise around here for a change”. We had a young rooster named Papa Smurf at one stage. He crowed like that ALL THE TIME. From sun-up to sun-down. He never even bothered learning the big boy crow…he was too busy running around finding grubs for his ladies and attacking us when we came into the pen. He once crowed like that in the backseat of our car and we only narrowly avoided putting the car into a ditch. Knowing that we’d once created noise like that with our rooster, and knowing technically we’re not allowed to have roosters in our suburb (a rule most ignore, but there it is) I know that feeling of panic every morning when they’re crowing their head off and you’re sitting there thinking “shutupshutupshutup” (because if you go out there and yell it he’ll think you’re joining in and an entire feedback loop of ridiculously loud noises, while he tries to ‘one-up’ you, will ensue.) So I was feeling a bit sorry for the neighbours. I was thinking maybe I’d pop my head over and tell them it was ok, that he was just finding his big boy voice and he’d sound lovely later. I told Ben this over breakfast and he said “That’s not a rooster. That’s Hairstyle.” I nearly splurked my coffee out of my nose. “IT’S WHO?!. As it turns out, our weird little bantam hen, Hairstyle, is the only one brave (or stupid) enough to take on boss hen Thelma, when Thelma is trying to lay an egg and is sitting RIGHT IN THE LAYING BOX HAIRSTYLE WANTS TO USE. This noise is Hairstyle’s new ‘ I’m displeased and the world WILL be told’ sound. There are another 3 empty boxes right next to them. I don’t know why I’m surprised, I have literally seen Hairstyle climb on top of another chicken in a nest box, lay an egg right on her HEAD and walk away like nothing happened. So, of course, once again it turns out it IS us ruining the peace and quiet of the neighbourhood and once again it’s me standing in the kitchen every morning, thinking “shutupshutupshutup”. To top it off, Hairstyle is clearly NEVER going to get her ‘big boy voice’..due to the simple fact that she’s not a boy.. Wonderful. 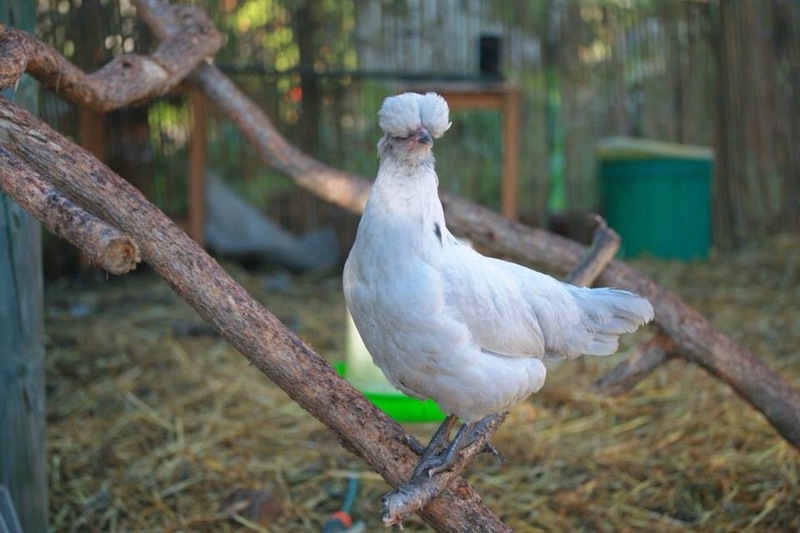 I’ve never seen a hen with a quiff before. A Rockabilly wannabe, by any chance? I think she might be. She’s the weirdest little hen ever. Lays tiny little blue eggs and actually loves to be cuddled. Loves to be cuddled? Are you sure she’s a hen. I mean, it really could be anything underneath all those feathers. I’m not sure at all, you are absolutely right. I think I had better have a look under those feathers…..we might have a spy in the mix!